Hard work and stressful indeed, but also an opportunity to spend a week in the sunshine with the intoxicating smell of wildflower hay floating on the breeze. 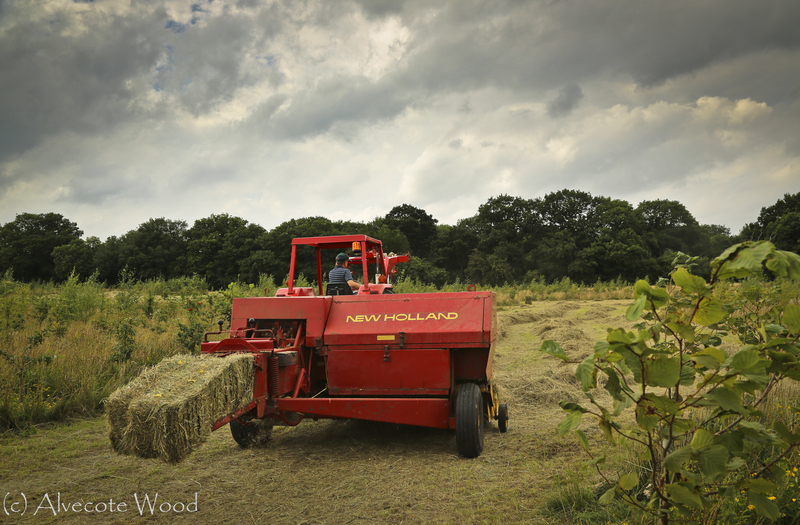 We have finally completed our hay-making for this year, and managed to get our harvest home just before the rain fell. 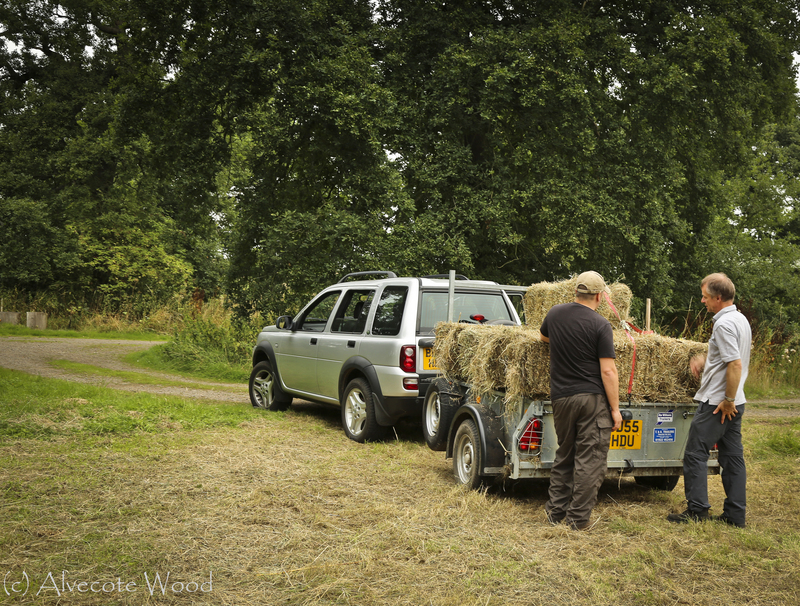 Our novice efforts were rewarded by seeing our harvest heading out of the woods to a nearby stables, and it was so very satisfying to think that something we were doing primarily for conservation and wildlife was also going to benefit horses. And with the added benefit that the food miles for these particular hay bales were very low indeed. We mowed the hay and turned it throughout the week, but with rain threatening on Saturday, we needed to get the hay gathered into rows and made into bales as soon as possible. We started this process using the hay-bob to create wind-rows. This was easier said than done, particularly because it could not reach right to the edge of the meadows, and also because of the limited manoeuvrability of the baler. This meant that a lot of wind-rows in the edges and more awkward bits had to be made by hand, using a rake and pitchfork. Nevertheless, by Thursday afternoon we were ready to attach the baler for the first time, and make our first bales. Just as we arrived at the meadow, there was a light shower, so we had to wait for half an hour while the sun re-dried the hay surface, but it was so warm and breezy that it dried in no time. Then we put the machine to use. It is quite an alarming piece of machinery, because it picks up the hay, uses an auger to move it into the bale chamber, then uses a ram to compress the hay, and a large and rather Heath-Robinson bit of machinery that looks like a cross between a massive set of surgical needles and a knitting machine to wrap the hay with twine and knot it off to form a bale. The whole thing shakes rather a lot, and makes the tractor judder too. But it is very effective. With threatening weather, we got going. On Thursday there were just three of us – Stephen on the tractor, and myself and Bernard doing the raking and stacking the bales. 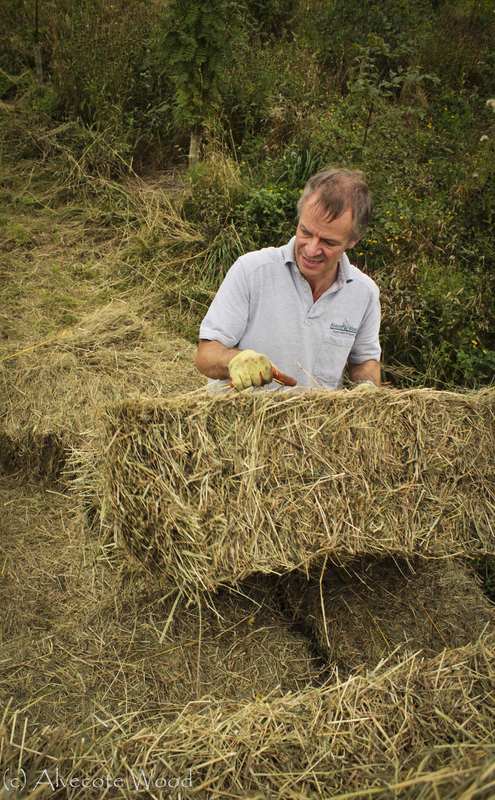 We were delighted to make 41 bales from our lower meadow, 43 from one of the top meadows and 36 from the other top meadow. All good quality wildflower hay. We packed up for the evening just as Butterfly Conservation Warwickshire were arriving for the night to do a moth-trapping session. A very long day. On Friday, we had many more helpers and this was very much appreciated. 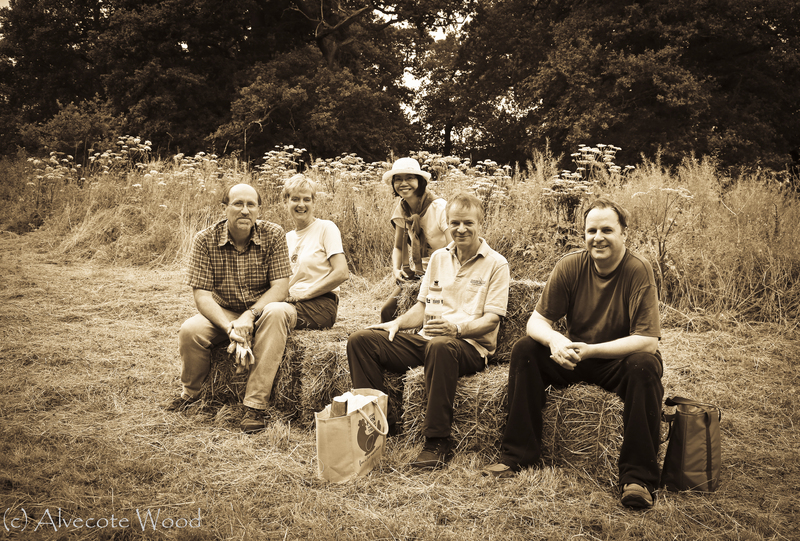 Gary and Connie, Keith and Heather from Butterfly Conservation Warwickshire and Chris who keeps bees at our woods all came to help, as well as our friend Daz. 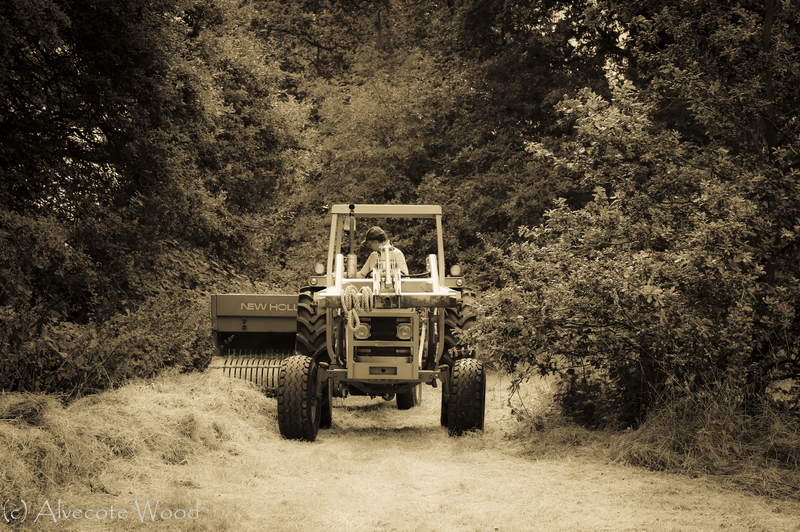 We quickly realised that the smaller meadow area in Alvecote Wood was going to be a challenge as it was just too awkward to use the hay-bob, and we had to make the rows by hand once we worked out the line that the baler would have to take. 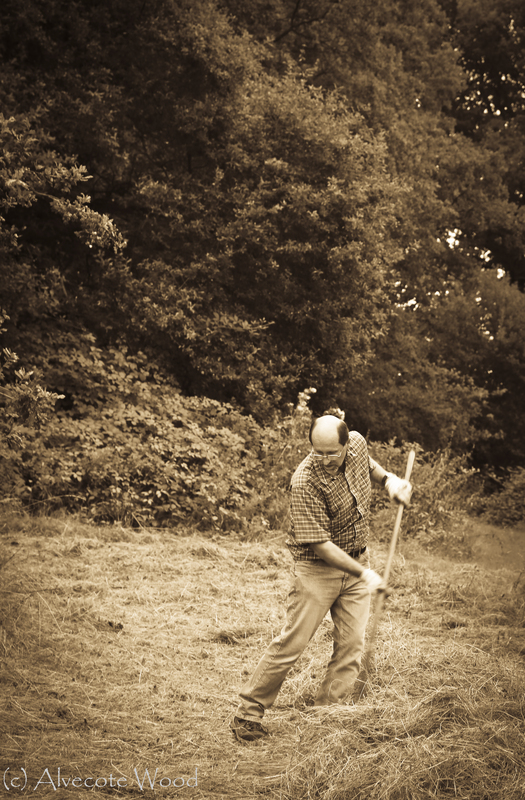 This meant rakes and pitchforks in good old-fashioned style, and created a scene that was centuries old. We were grateful of the pile of bales to sit on for a rest and cup of tea. With rain forecast for 3pm, we then took the trailer down to Betty’s Wood meadows, and moved all the bales together into a haystack which we could cover with a tarpaulin if it decided to rain. We had sold the bales to stables nearby, so we stacked one load onto the trailer ready to drive it round to them as soon as they arrived. We managed to avoid the rain yet again, and carried the bales round to the stables in lots of 21 strapped to the trailer. It was so exciting to see the bales heading to a new home. Just after 5pm, with the rain staying clear by a miracle, we loaded the last few bales onto the trailer as the first drops of rain started to fall. Harvest home! It was a reall emotional moment. The woods are just so amazing, and we have got used to making products from the wood itself, as well as using it for firewood. It was wonderful to think that yet another activity that we were doing primarily for nature and conservation had produced a useful crop, that was going to feed the horses, and was yet another sign that nature and people can work in harmony. 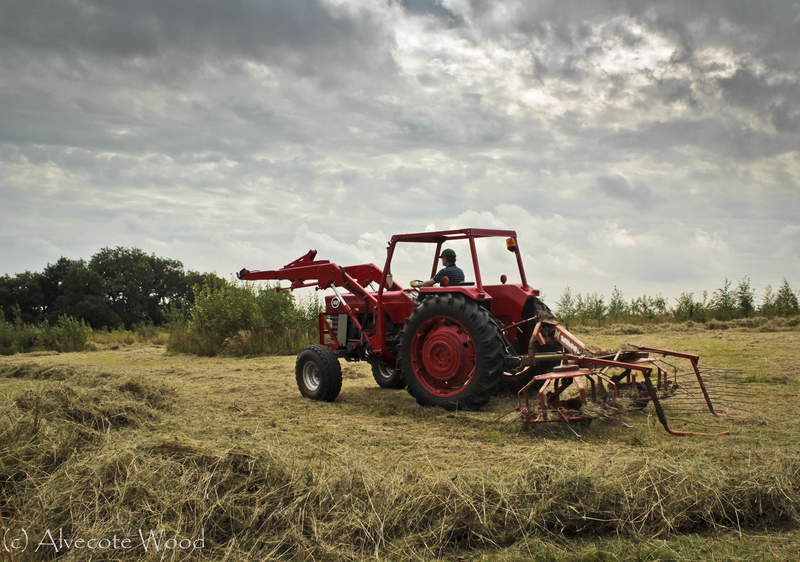 Haymaking is astonishingly hard work, particularly if you have to do some of it by hand, but also immensely satisfying. The smell of hay will last in my mind until next year, when we have promised the stables that we will do it all again! We would like to say a huge thank you to: Our helpers in the field – Gary, Connie, Heather, Chris, Daz, Keith and Bernard. Our advisers – Les Armstrong (the blacksmith), Bernard and Gary, Ian Glover Tractor Spares (for sorting out esoteric parts for elderly equipment at short notice), Richard White (local farmer with his own great hay meadows), Christine and Gaenor for taking a risk and purchasing our first ever hay and the team running the business at home (Bob, David and Roger) while we’ve been busy out in the fields. So here’s to harvest home, and yes, we will do it all again next year. 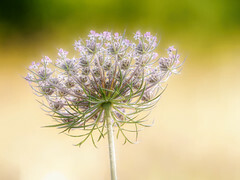 This entry was posted in Our News, Photography and tagged baling, Grass, harvest, Hay, haymaking, meadows, mowing, wildflowers, woods. Bookmark the permalink. What tractor is that – MF 135 perhaps? 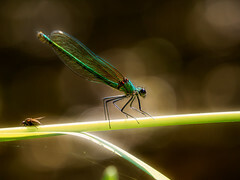 Very close. It is a Massey Ferguson 188 Multipower. Need the extra oomph to pull the bailer and do forestry work.